In fact, check out this tasty recipe that packs in 30 grams of protein. 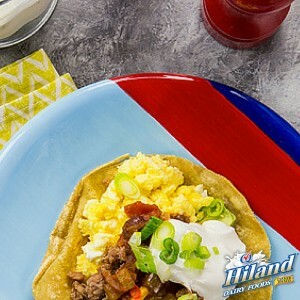 This Mexican-style breakfast is both hearty and healthy, making it the perfect start to any day! In a bowl, whisk together egg and 2 tablespoons milk. Season with salt and pepper to taste; set aside. Heat a non-stick skillet over medium heat. Add tortilla to skillet and heat for 10 seconds. Flip tortilla and heat other side for 10 seconds and remove to a plate. Heat olive oil in same pan and add egg mixture and cheese. Cook eggs over medium-low heat, stirring gently with a spatula until cooked through, but still creamy. Remove from heat. Top heated tortilla with turkey sausage, avocado, scrambled egg, salsa, Greek yogurt, green onion and optional dollop of hot sauce. Serve with an 8-ounce glass of milk.